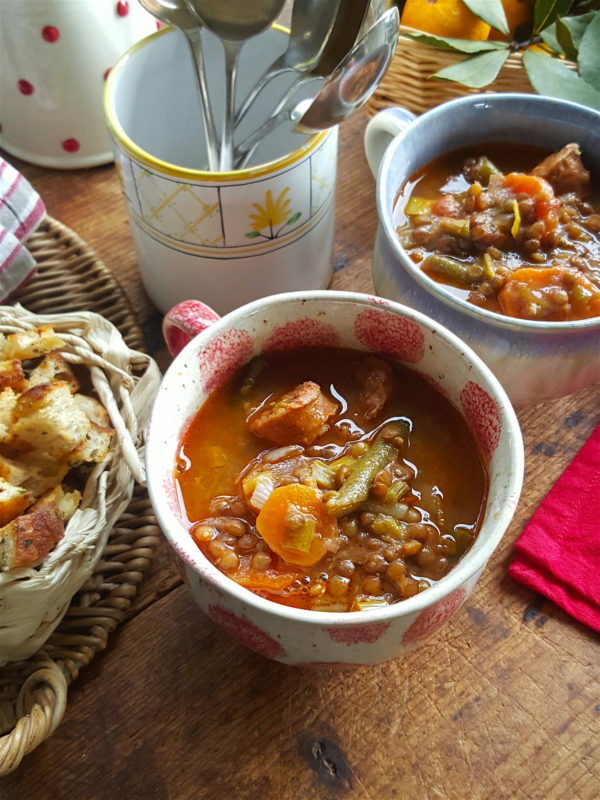 Chorizo gives this puy lentil & chorizo soup plenty of oomph. This should be so thick that you can nearly stand a spoon in it. 1 Put oil in a saucepan and set pan over a low to medium heat. Drop in butter, then leek, celery, carrots and garlic and thyme. Cover pan with a lid, lower heat and cook gently for 15 minutes, until very tender; if vegetables look as if they are starting to catch, splash in a little water. 2 Heat a slick of olive oil in a medium-sized frying pan over medium heat and add the chorizo. Brown quickly on both sides, turning with tongs, then tilt pan, let fat drain off and transfer to a plate; don’t cook the sausages right through as they continue cooking in the soup. 3 Add stock, water, tomatoes, green beans and lemon zest to vegetables. Rinse lentils in a sieve until water runs clear and add to soup with drained chorizo. Bring to the boil, then lower heat and cook gently, partially covered with a lid, for 45-50 minutes or until everything is very tender. Add salt, then check seasoning. Mash gently 3-4 times with a potato masher to thicken the soup. If soup requires a little more liquid, add hot stock or water. If liked, serve with a drizzle of extra virgin olive oil. This should be so thick that you can nearly stand a spoon in it., however, it can be thinned with a little hot stock or water at the end of cooking if you need to stretch it to serve more people. If liked, drizzle individual bowls with a little extra virgin olive oil before serving. 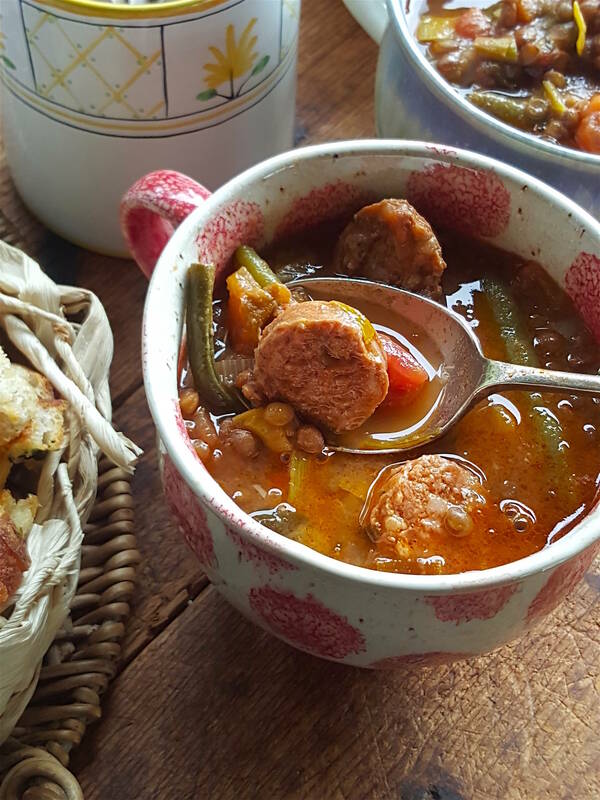 It’s important to use top quality meaty chorizo sausages, not bags of sawdust and fat. A feasting platter to keep ya truckin' on. Blueberry Muffins – Best Ever! Scrumptious. Best-ever. All of that. These are the only muffins you should be making. This is always a crowd pleaser. Ramp it up a notch with lemon oil, green chilli and spiced rockmelon seeds!